Tree works at the south end of the park are set to continue into next week. Earlier in the year the Council Trees and Woodlands officers identified a number of the old cherry trees that were diseased or rotten at the base as well as 5 of the tall Lombardy poplars along the southern boundary of the Park were in poor condition. 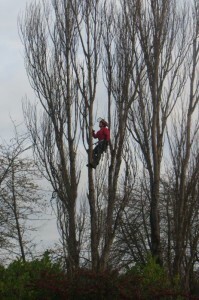 As a safety measure the trees identified are being felled. The loss of these trees from this area is regrettable but, as they are alongside a path, public safety is paramount. The Friends group will be working with the council on a plan to replace the cherry trees but this is dependent on funding. 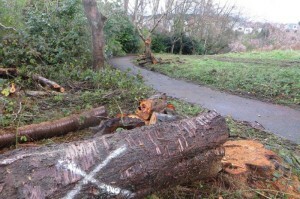 The path along the southern boundary is likely to be closed at times when the felling is taking place. Most of the wood from the trees is being stacked in this area and will be left to rot away as a wildlife habitat.